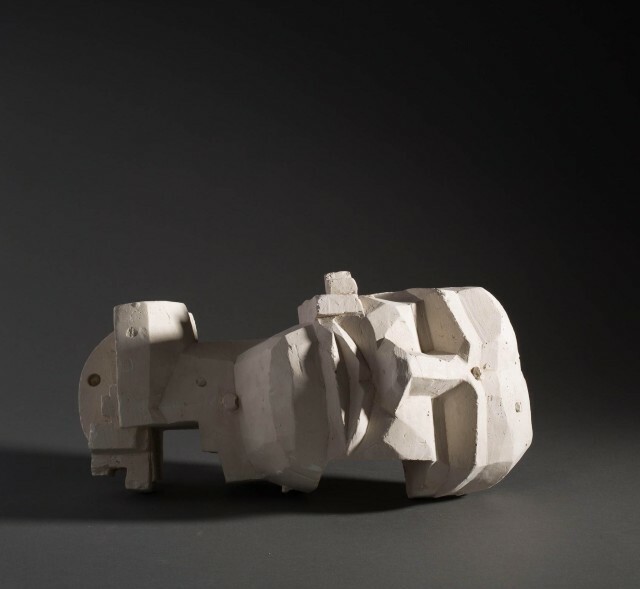 There is almost no British artist of the post-War period who was as innovative as Eduardo Paolozzi. Known primarily as a sculptor, he is widely credited with inventing Pop Art through his ground-breaking slideshow at the Institute of Contemporary Arts in 1952, which featured the collages he had made from magazines given to him by American servicemen in Paris in the late 40s. It was in Paris that Paolozzi had met some of the great figures of 20th century art, including Giacometti and many of the original Surrealists, whose dual influence can be felt in the extraordinary group of lost-wax sculptures made by Paolozzi in the mid 1950s, their surfaces studded with found objects and machine parts, which were to gain him international recognition. Paolozzi was constantly re-inventing himself and his work of the 60s, 70s and 80s is defined by its diversity, both of medium - sculpture, reliefs, drawings, collages, mosaics, prints - and form - veering from the highly coloured and wildly figurative to the almost monochromatic and abstract. As well as being the focus of public exhibitions at such institutions as the Royal Academy, the National Portrait Gallery and the Victoria & Albert Museum, he has works in major public collections worldwide, including the Tate Gallery, the National Gallery of Modern Art, Edinburgh, and the Peggy Guggenheim Collection, Venice.